PDF Password Recovery! PDF Password Reset! 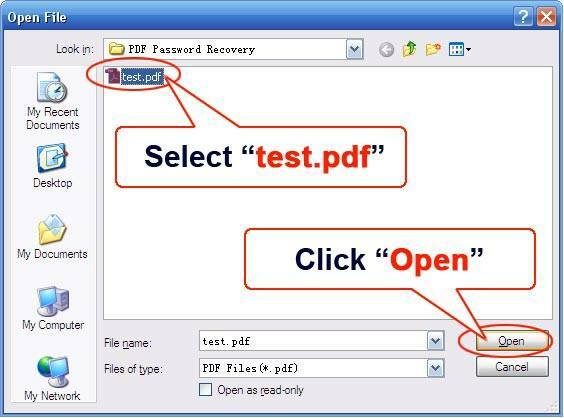 PDF Password Retrieve! Portable Document Format (PDF) is a file format created by Adobe Systems in 1993 for document exchange. PDF is used for representing two-dimensional documents in a manner independent of the application software, hardware, and operation system. Each PDF file encapsulates a complete description of a fixed-layout 2D document that includes the text, fonts, images, and 2D vector graphics which compose the documents. Lately, 3D drawings can be embedded to PDF documents with Acrobat 3D using U3D or PRC and various other data formats. And as a result of its powerful function, it is adopted by enterprises, educators, and governments around the world to streamline document exchange, increase productivity, and reduce reliance on paper. Due to its popularity in the whole world, the security and privacy are more and more concerned by the majority. 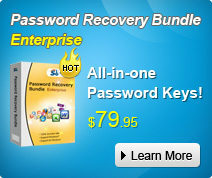 Therefore there are different methods and two different passwords, “user password” and “owner password”. A PDF document protected by password is restricted in printing, copying text and graphics out of the document etc, even when it is decrypted by “user password” while it is allowed to be operated freely when it is decrypted by “owner password”. With so flexible and complex the password is, the problem probably comes that the PDF password maybe forgotten or remembered falsely. How do we recover the PDF password or reset the PDF password when we confront such a tragic situation? Fortunately, as far as I know, there are methods, such as Brute Force Attack and Dictionary Attack can resolve the problem. However another question comes, with so much software can retrieve PDF password, which one should be chosen? Well, according to my own experience, I recommend you PDF Password Recovery 5.0, an easy-to-use tool designed for removing passwords added to Adobe Acrobat PDF documents. 2. Do NOT need Adobe Acrobat software. 10.Free updates during one year. Step1: Click “Open” button of the File Name to browse the full path of the PDF file. Select the target PDF file in the Open File window and click “Open”. Step2: On the “Recovery” tab, select “Brute-force Attack (Trying All Possible Combinations)”. Step4: Some time later, a message box pops up to you, showing the User Password expected. Click “Remove All Passwords from the File” to remove all the restrictions placed on the PDF file. Click “OK”. Then you will recovery your PDF password. 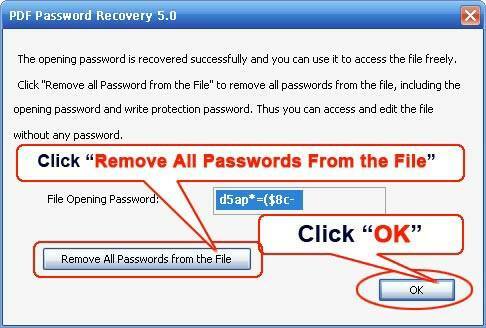 PDF Password Recovery 5.0 can be downloaded on it official website. By the way, there is a tool there called Password Recovery Bundle which including not only PDF Password recovery 5.0 but also other programs that can recover your windows password, office password as well as rar password.